While studies of sonic mechanisms among vertebrates date back more than 100 years, the past 25 years have witnessed a burgeoning of interest in the bioacoustics and behavioral ecology of sound production among fishes, including in its neural basis. 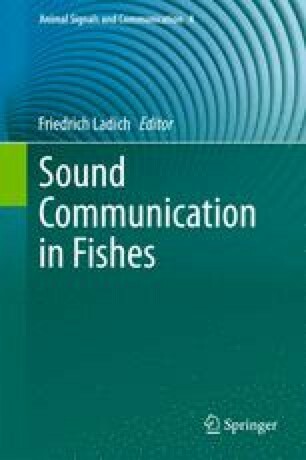 Here, we review the body of comparative literature on the neuroanatomical, neurophysiological, and neuroendocrine mechanisms of sound production/vocalization among fishes. Most studies have focused on teleosts, the most species-rich group of living vertebrates. The past decade alone has witnessed the demonstration of (1) an extensively connected vocal-acoustic network at forebrain , midbrain , and hindbrain levels, (2) distinct neural populations comprising a central pattern generator (CPG) that directly determines the physical attributes of social context-dependent sounds including pulse repetition rate (PRR) , fundamental frequency , duration , and amplitude , (3) a highly conserved pattern for the evolutionary developmental origin of vocal CPGs between fishes and tetrapods , (4) shared origins between vocal CPGs that are dedicated to sound production and pectoral appendage motor systems that function in both acoustic signaling and locomotion, and (5) forebrain, midbrain, and hindbrain targets in the vocal-acoustic network for the modulatory actions of steroid hormones and neuropeptides . In sum, the relative simplicity of acoustic signaling in fishes and of the underlying neural circuitry offer both insights into the evolutionary history of sound producing mechanisms among all vertebrates, and practical advantages for investigating adaptations at the cellular and network levels of neural organization that sculpt behavioral phenotypes. Thanks to F. Ladich for the invitation to write this chapter and for helpful editing of an earlier version of the manuscript; E. Adkins-Regan, K. Boyle, G. Budney, U. Jurgens, F. Ladich, M. Marchaterre, E. Parmentier, L. Remage-Healey for sound recordings displayed in Figs. 2.1 and 2.4; and K. Boyle for help with Tables 2.1 and 2.2. Research support during preparation of this chapter was provided by NSF IOS-1120925.